The moment that I heard that Dame Angela Lansbury was returning to the London stage after almost forty years away, I just knew that I had to see her. 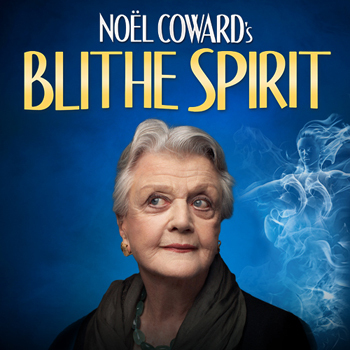 The legendary actress reprised her role of Madame Arcati in Noël Coward’s comedy Blithe Spirit at the Gielgud Theatre earlier this year and the prospect of seeing her perform live on stage truly excited me. I probably shouldn’t admit that I have seen a few too many episodes of Murder, She Wrote, but watching the amateur sleuth Jessica Fletcher solve a murder is a guilty pleasure of mine. At 19, I am undoubtedly in a minority of murder mystery fans, still, I do believe that many of you know and love Angela Lansbury even if you do not realise it. Remember that quirky apprentice witch Eglantine Price in the classic Disney musical of your childhood Bedknobs and Broomsticks? Or, perhaps the animated teapot that sings ‘Tale As Old As Time’ in Beauty and the Beast. Maybe you laughed at Great Aunt Adelaide being distracted by a dancing donkey in Nanny McPhee or hoped that Mrs. Van Gundy would let Jim Carrey’s Mr. Popper keep his penguins. You see, Angela Lansbury has been a part of so many of our childhood memories and I have not even touched on her countless other film, television and theatre roles over her 70 year career. They say that you should never meet a childhood hero or a person whom you admire because they may disappoint you. So, as I sat in the Gielgud Theatre waiting for the play to begin, I did have flashes of doubt over whether my admiration for this actress would be tarnished if I didn’t enjoy her live performance. Happily, I can say that those doubts were washed away the moment Ms. Lansbury appeared on stage to a welcoming of applause and cheers from the entire audience. The play was fantastic. Praise is absolutely due to the whole cast for their hilarious characterisations and perfect comic timings. Janie Dee performed especially well as Ruth, the wife of Charles Condomine (Charles Edwards) who suffers the torments inflicted by the invisible, yet provoking, ghost of Charles’ deceased first wife, Elvira (Jemima Rooper). Scattered appearances of the hilariously tactless maid portrayed by Patsy Ferran also greatly contributed to making this a play that was simply difficult to dislike. Unsurprisingly, for me, it was Angela Lansbury who stole the show. At 88 years old I have to admire the energy, enthusiasm and effortlessness of her performance. One stand out moment was Arcati’s captivating séance dance that had the audience in fits of laughter. Everything about Angela Lansbury’s performance provided conformation that she is a truly legendary performer. Here’s to hoping that she will return to the London stages in the near future.